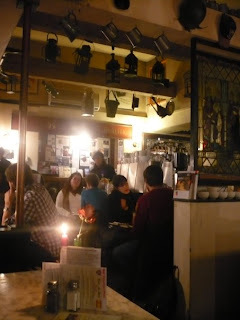 The Troubador Cafe, in Earls Court, is a West London institution. It sells itself as 'the last 1950s coffee house in Earls Court, with a proud history of courtesy, peace and artistic energy', and it's a lovely place to hang around for an evening. London often seems to lack places for a nice cup of tea after dark, but thankfully the Troubador fills that vibe, and serves tea, food and alcoholic drinks from 9am until midnight every day. The Troubador Club is downstairs and since its opening in 1954 it has played host to a range of artists, peaking in the 1960s when Jimi Hendrix, Joni Mitchell, Bob Dylan and Paul Simon graced the stage. The cafe also has its own wine shop next door, which stocks a wide range of wines from £5 upwards.